Probably one of the most exciting things we’ve done together. Probably something we would never do if we had too much time to plan. This was over a year ago but we were too caught up to post, oops. Talking about some of the excuses and baseless refutations made by women who just cannot bring themselves to practicing Hijab, most of us having made the same ones but finally overcoming them, we verbalized some counter-arguments and came up with some awesome resolutions and conclusions that would never have crossed our minds otherwise. All of us had started Hijab a long time ago but it’s never just a one-step process. There’s a lot more to the Hijab than just covering your hair, or wearing longer, looser clothes, or even covering your face! Some women have roller-coaster Hijab stories, while some find it to be a smooth transition. There are incidents that make you doubt your decision, and incidents that make you feel like an ambassador of Muslim women all over the world, and then there are just some random, uneventful and boring incidents such as not finding a Hijab pin and getting frustrated. There are people that make you feel unworthy, backwards, and even… ugly, and then there are people that treat you like a queen. Sometimes these are people that you really care about, and sometimes they are strangers that leave an impression and a mark that will never leave you. In the end all of these bits and pieces need to be sorted and sifted through to come to a final and concrete resolution about why you choose the Hijab as a lifestyle and not just as a religious obligation. F.P told us about a group of women and girls that her family had volunteered to teach at Masjid Al Bara’ situated in their neighborhood. The Filipino community is so well-known for their characteristics of unity, open-mindedness and a motivation to learn. F.P and her family had been administering Quran halaqas for age groups starting from about five onwards. 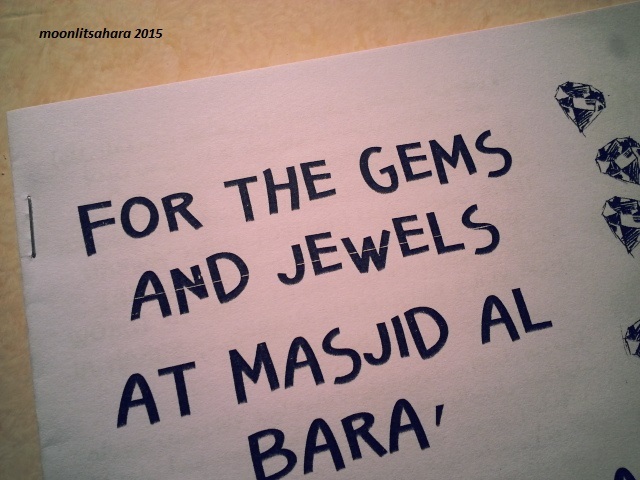 The invitation was an event that Fatimah wanted to plan for WHD at the Masjid. Yes, we don’t need a singled out time of the year to raise awareness about the Hijab, but seizing this opportunity to have an open discussion with her group of girls at the Masjid seemed like a really good idea. I got to work immediately. Limited resources, limited time, limited abilities. Niqabinja and I brainstormed over the phone since we didn’t have enough time to have a face-to-face discussion. I took up responsibility for handouts, while Niqabinja took up our speeches (and transport! ), and F.P was all set and ready with event coordination and supplies. The talk was hurried and we were both really flustered, since we hadn’t practiced anything. We got there at around Maghrib time and gathered everyone right after Salah. It was an altogether exhilarating experience, standing there watching young faces ease into the speech as we made it a point not to be preach-y. 🙂 We acted out a play and then took up questions for discussion, most of which demanded a lot of vulnerability, openness, empathy and support. To make these girls IDENTIFY themselves as devoted Muslims, to help them find freedom, honor, dignity, respect, empowerment and FAITH, to make them understand that it’s not an easy step but it’s definitely worthwhile. We had a short Q & A session and had discussions with the girls about Hijab in extended family gatherings, Hijab in the West, faith and fashion, and the criteria for correct Hijab according to Shari’a principles. The best part is that they catered to a minority group that actually wants and is in need of valuable, authentic Islamic education and an environment in which they may learn and grow as Muslims. This is always a huge problem for foreigners living in Middle-East countries, and there aren’t many options available due to language barriers. This hinders some people and slows them down, while it gives other people the opportunity to innovate and be an asset to their minority group just like the entire Pango family is. Having learnt and obtained substantial knowledge of Arabic, Tajweed and also having Quran memorization experience; they fit into the teacher roles perfectly and do their job so faithfully and diligently, it is inspiring beyond belief, masha Allah. It was such an honor to interact with them and connect at a deeper level-hearing their views and concerns, getting to know their struggles and experiences. Yeah so that was awesome. 😀 A lot has happened since then. We’ll pour it in slowly I guess. Right, Niqabinja? Psssssssssssstt.. hadith circles.